If you crave Italian but hate the carbohydrates that come with eating a big pasta dish, then you will love trying our Skinny Spaghetti Squash with Meat Sauce. The tender spaghetti squash serves as the perfect substitute for pasta combined with lean (but flavorful) sauce! This dish is not only delicious, but it is also under 200 calories (and 19 carbs!) per serving and will quickly become an Italian family-favorite. Plus, the oozing cheese melted on top provides major bursts of flavor and divine texture. To cook squash in oven, cut spaghetti squash in half lengthwise. Scoop out seeds and membrane. Place squash cut-side up on baking sheet. Sprinkle with salt and pepper and bake for 45-60 minutes. To microwave squash, cut spaghetti squash in half lengthwise. Scoop out seeds and membrane. Place squash cut-side up in a microwave safe dish with 1-2 inches of water (just enough water to cover bottom of microwave safe dish). Microwave 9-10 minutes until soft. In a large, deep sauté pan, add extra virgin olive oil. Add onions, celery, carrot, and mushrooms. Saute vegetables on medium heat for 3-4 minutes until they begin to soften. Add lean ground beef to vegetables. Continue to cook vegetables and brown ground beef, breaking up the meat into smaller pieces. Continue to cook until meat is no longer pink in color. When meat is cooked, add chopped zucchini and jar of spaghetti sauce. Stir to mix all ingredients together and simmer on low for 5-10 minutes. Adjust sauce with salt and pepper. When spaghetti squash is cooked, remove from the oven or microwave and let cool for 5 minutes. After it has cooled, begin to remove the flesh with a fork, which will come out looking like spaghetti strands. 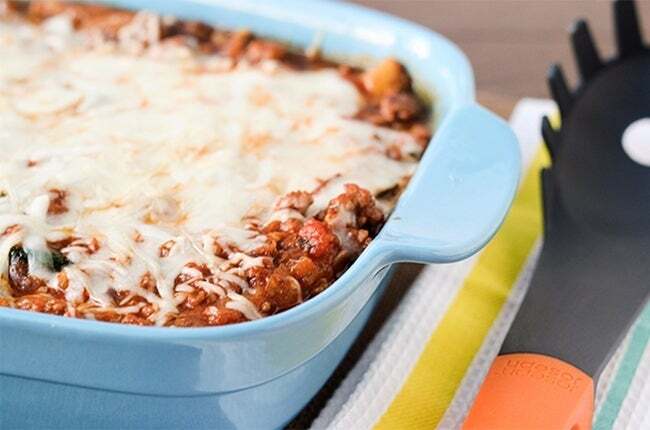 Serve with sauce OR transfer spaghetti squash to a casserole dish. Cover the squash with meat sauce evenly. Top with mozzarella and bake in oven at 350 for 10-15 minutes until cheese has melted. Serve hot.